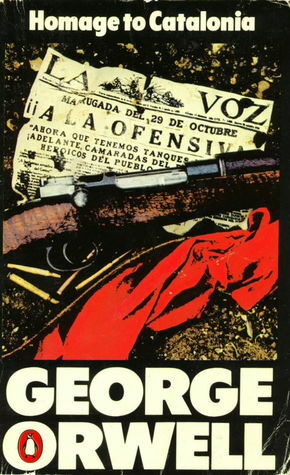 George Orwell was among those foreigners who travelled to Spain to enlist on the Republican side of the Spanish Civil War (1936-9), and in less than a year of experiences he talks about training, fighting on the front line, being involved in the street-fighting that broke out between the various leftist factions in Barcelona, being wounded by a bullet through his neck, and finally barely escaping Spain with his wife when the organization he had fought with, and had already been discharged from, was declared to be sympathizers with the enemy in a cloud impenetrable non-truth that would not be out of place in his novel Nineteen Eighty-Four. Interspersed with Orwell’s personal experiences is commentary on the different political forces at play, and the betrayal of the ideals Orwell felt he was fighting for, up to the point where he realized it was a fight between two possible future forms of dictatorship. I don’t know a lot about the Spanish war, and I picked this book up as a fan of Orwell’s writing. There’s a lot of sections that are an alphabet soup of acronyms, and it’s sometimes hard to find your way if you’re not familiar with the history. Even the description of the fighting at the front somehow comes across as a bit dry and dull, and the only really compelling parts for me were when the fighting among leftist factions breaks out in the city, and then the final section where Orwell tries to find a way out of Spain with his wife, while most of the people he has known are thrown into jail without being charged by the very Government side they were fighting for. Also interesting was Orwell’s description of taking a bullet through the neck, his immediate thoughts and feelings as he thought he was going to die, and his recovery afterward. The thing that probably surprised me the most about this book is that I always thought of Orwell as a sort of ‘disillusioned socialist’, but all throughout this book, no matter how bad the behaviour he sees among the leftist forces and administration, he never gives up his idea of a worker’s revolution, which is in his mind is somehow set apart from communism. Though I wouldn’t agree with his ideal of the overthrow of capitalism (or even the notion that history is moving in a direction of continuous improvement) this book is important in that it gives a good first-hand account of events, and contrasts them with the outright lies that were published in newspapers both in the country and internationally, no matter which side the editorialists sympathized with. The book-length Homage to Catalonia is appended with an essay written about 15 years later, Looking Back on the Spanish War, which gives a bit of perspective. Maybe the most amusing part of the book is when Orwell visits Antoni Gaudi’s Sagrada Familia church and calls it “one of the most hideous buildings in the world” and questioned the tastes of the Anarchists in not blowing it up when they had the chance.